As the Narendra Modi-led Bharatiya Janata Party (BJP) government is about to complete its five- year term, what stands out among many of its muddled policies is its approach towards the sensitive political issue of Jammu and Kashmir and, by consequence, the horrendous treatment of Kashmiris. Right through these five years, both BJP and the larger Sangh Parivar have infused the issue of J&K with their violent and divisive political discourse that they practise freely in the rest of the county. What we are seeing in Kashmir now is only an abyss of violence and hopelessness. The recent wave of terrible violence which saw a number of casualties of civilians, militants and armed forces is a testimony of this. There prevails widespread anger, alienation, despondency, and complete lack of faith in the political institutions among people in Kashmir. It is true that previous governments also did not take any serious initiative vis-a-vis Kashmir, but BJP has somehow managed to link Kashmir with the politics of hate and divisiveness. Any political engagement with Kashmiris has now become a remote option for it, as a result of which not just Kashmir but the whole of India has been put on a perilous path. The secular, plural ethos of the state which brought J&K closer to India in the exceptional circumstances of 1947 were wedded to a certain constitutional and democratic framework that laid the foundation and later safeguarded the relationship between J&K and the union of India. Since Sangh Parivar’s ideology and politics stands antithetical to secular and democratic values, it has always made efforts ever since Shyama Prasad Mukerjee’s communal sojourn into J&K to scuttle the guiding relationship between J&K and India. Times may have changed, but Sangh Parivar’s essential approach vis-a-vis Kashmir remains the same. Now that the BJP has a majority government at the Centre, the Sangh has become emboldened in leading all kinds of vicious assaults on every constitutional relationship that linked India and Kashmir. The assaults on the political identity of the state, as reflected in the assaults on Article 35-A and Article 370 continue unabated. After the imposition of the Governor’s rule last year and subsequently, President’s rule, the state going through the worst phase of political vacuum and governance crisis. Right through the past five years, and even now, with Lok Sabha elections just round the corner, the BJP government led by Narendra Modi has made Kashmir an epicentre of hyper-jingoistic and fascistic principles. This was done keeping in view the electoral benefits in the rest of the country as the issue of Kashmir was tied to the Right-wing definition of nationalism. This approach, aggressively used in the 2017 Uttar Pradesh Assembly polls, yielded a good electoral outcome for the BJP. Even in the Delhi Municipal polls of 2017, which are usually fought on the plank of civic amenities, high octane references were made by BJP leaders linking Kashmir with their imaginary version of nationalism. Kashmir has certainly become the central thread with which Sangh Parivar is currently weaving its politics of hatred across the country, as reflected in various statements made by some top BJP leaders. In these five years, we heard the frequent rants by some prominent Sangh Parivar leaders, be it Arun Jaitley , Ram Madhav etc. It is worth mentioning that after the Pulwama attack, the online Right-wing trolls and Hindutva mobs that harassed Kashmiri students and traders in North India were just echoing some of these threats on the ground. In every way, Modi has followed the same line of approach on Kashmir that the broader Sangh Parivar advocates. This was clearly evident in his mischievous silence on the killings of civilians in Kashmir and his arrogant refusal to even acknowledge the problem as a political one. Despite the fact that he was holding the most important constitutional post in the country, Modi was badly failing his responsibilities. The kind of approach he and his government adopted vis-à-vis Kashmir and Kashmiris has badly damaged the democratic and republican values that India was supposed to offer to Kashmiris. As such, all Indians are entitled to make him accountable on this reckoning. Prior to 2014, many Kashmiris had renounced the path of violence which had gripped them ever since the dark decade of the 1990s in favour of a political struggle that supposedly had some consonance with India’s democratic polity. This was reflected in the large participation of people in democratic exercises despite sporadic acts of violence and the non-commitment shown by previous central governments in showing any will to resolve the issue. But what Modi’s irrational approach (which included the harshest military measures in the form of Operation Calm Down of 2016 and the ongoing Operation All Out launched in 2017) did is that it has made all these voices vanish. A stark distrust for Indian democracy has now crept among people. The space for a pacifist approach has shrunk and the call for violent resistance is finding traction among Kashmiri youth, who are mostly in their late teens and early 20s. To these youth, the idea of India came through the Sangh Parivar and its hateful acts in mainland India in the name of “cow protection” and “love jihad” vigilante gangs. Besides, corporate-owned electronic media constantly ran hate campaigns vilifying Kashmiri and Kashmiris. It is no surprise that an extremist consciousness is being manifested in the recent suicide bombings taking roots in valley, with many youth taking to the gun. More than anyone else, it is the BJP, the larger Sangh Parivar, and the frenzied corporate media houses that are playing into the hands of Pakistan, if we go by the larger Indian narrative, and thereby helping it in the exact way as it wants. This is one of the more seriously disastrous ‘achievements’ of the five-year rule of the Modi government in Kashmir, which should worry every right-thinking Indian. Amidst all this atmosphere of distrust and fear, if someone like Farooq Ahmad Dar of Budgam did dare to put his trust in democracy and republicanism, he was repaid with betrayal, torture and oppression. After voting in the parliamentary bypoll, he was made a human shield by the Indian Army and paraded through several villages. Adding to his miseries was the fact that this act of oppression was condoned brazenly by the Modi government. Its army chief publicly commended the torturer of Dar by an award. One wonders what this signifies for Kashmiris in general and to those specifically who are still holding on to the trust that they have reposed in India? The way Farooq Ahmad Dar of Budgam was made a human shield after he had just cast his vote amidst all the calls of boycott and atmosphere of fear was emblematic of how the BJP government wantonly violated the fundamental human and constitutional rights of Kashmiris. What is also so specific about Modi’s five-year rule vis-à-vis Kashmir is the current critical situation where all kinds of violence is being perpetrated on Kashmiris, but he himself puts veneer on all of that with his crafty slogans. For instance, during these five years, in public gatherings, Modi has alternated between several platitudes like “Vikaas ki Oonchayi” (Height of development for Kashmir), “Pathar nahi Laptop”(Use laptops, not stones), “Fight for Kashmir, not against Kashmiris” etc, while keeping a deafening silence whenever killings took place. In the run-up to the 2014 Assembly elections in J&K, the People’s Democratic Party (PDP) had sought votes in the valley to keep a check on the intrusion of Right-wing BJP in the state. Similarly, BJP had sought votes in the Jammu region playing the Dogra card. In one of his rallies in Kishtwar, Modi had hit out at J&K’s political parties like PDP and National Conference calling them “exploitative, opportunistic, and highly inefficient ruling dynasties.” But then, his party went on to tie up with one of the parties belonging to the same clan of “ruling dynasties”. 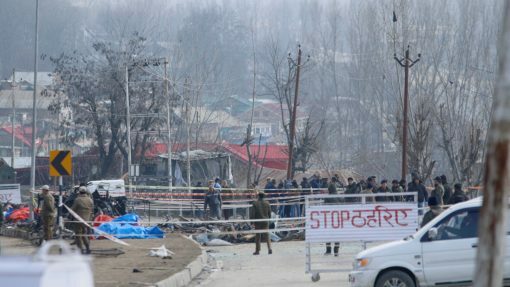 In a public rally in late 2015 in Srinagar, Modi reiterated former Prime Minister Atal Bihari Vajpayee’s much glorified slogan of “Insaniyat, Kashmiriyat and Jamhoriyat” and told the people that “coffers and hearts of New Delhi will be opened up for the people of Kashmir.” But what the people of Kashmir got in 2016 instead was blinded eyes and bleeding hearts. What was more hurting is that there was a constant refusal to listen to or even acknowledge the suffering of Kashmiris which is reflected in the BJP leaders frequently talking about the use of a ‘muscular’ policy while refusing any initiative of dialogue and reconciliation. For the BJP, every dissenting Kashmiri is an enemy of the state. It is no surprise, therefore, that Kashmir has been thrown into a vicious cycle of violence and unrest, failure of local governance, and an ever-increasing penchant for militancy. The situation is deteriorating to unprecedented levels, as is the anger of a hurt, humiliated and oppressed populace which is now looking for violent means. This is not to suggest that Kashmiris have been overtaken by the Freudian death drive; they indeed desire peace and development, but only when it comes with fulfillment of their aspirations with dignity and justice.